The pearl is truly a gem of a vacation spot on the coast of Lake Michigan. This property has been the most popular vacation rental in the area for many years. The pearl is the largest home in the popular Beachwalk resort community. It's unique location on the tallest dune in the area, provides for panoramic views of Lake Michigan spanning from Warren dunes to Chicago. It is short walk from Sheridan Beach with full access to resort amenities including the pool, lake Kai with its fishing pier, kayaking, paddle surfing as well as tennis courts, golf cart rental, and several private playgrounds. This unique property is now under new ownership and management. What sets this property apart from the surrounding vacations homes is that the new owners have made The Pearl their permanent residence. Therefore, this house is cared for year round and feels like home. Luckily the owners have decided to share their beach resort with a select few vacationers. The property is available for weekly rental between Memorial Day and Labor Day. To make this experience unique, the owners have teamed up with a local management company which specializes in boutique luxury vacation rentals. Together they hope to bring you and your families a lasting experience to cherish for many years. The Pearl is the largest home in the popular Beachwalk resort community. It boasts over 5100 ft.² of living space. The large living space is divided into four above ground levels to allow for privacy while accommodating large groups. All four levels are furnished with luxury furniture. 1st level: This level includes a large entertainment area equipped with a 65 inch TV for movies and gaming. There is also a bar and poker table. On this level there is a full size futon bed and a bunk bed to accommodate sleeping arrangements for 4. There is also a half bathroom. This level has unobstructed views of the lake. 2nd level: this is the entry level with access to the garage. It has a formal living room with panoramic views of the lake, a bedroom with a queen-sized bed and a private balcony over looking Lake Michigan, laundry room, and a large full bathroom. 3rd level: This is the main living space for the house. 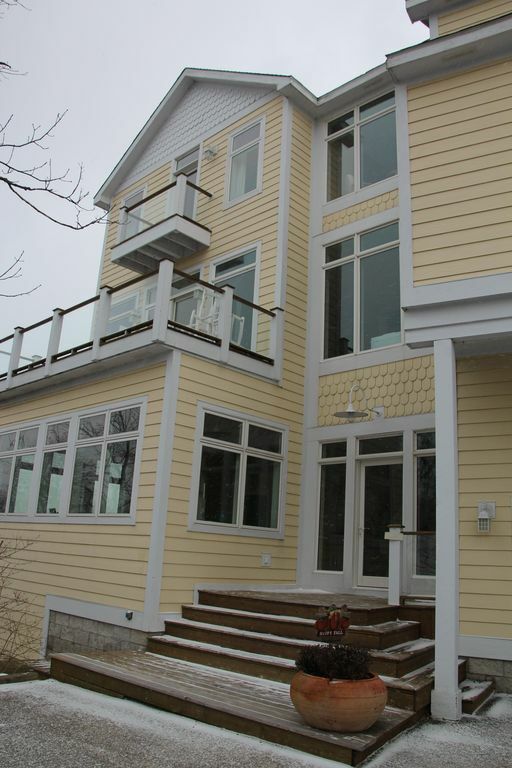 It includes the master bedroom with a king-sized bed, private balcony with views of the lake and Michigan city lighthouse as well as a spa-sized en-suite master bath with walk-in shower and jetted tub. This floor also houses the large open kitchen with views of both Lake Michigan and lake Kai, dining room with ample sitting for 16 to 20 people, powder room, and the large family room with fireplace, TV, and panoramic views of three states spanning from Warren Dunes, Michigan to Chicago, Illinois. You also will find access off of the kitchen to the home's largest entertainment deck equipped with a large grill with rotisserie and memorable views perfect for outdoor dining. 4th floor: The fourth floor houses 3 bedrooms and one large spa- quality bathroom with walk in shower, jacuzzi tub and double sinks. The first bedroom is a large room perfect for our younger guests. There is a total of three bunk beds and two twin beds allowing for sleeping arrangements for up to 8 of our younger guests with ample play area and TV so they can talk about and share their daytime adventures at the beach. The other two bedrooms each have a queen-sized bed and private balconies with views of the lake perfect for capturing views of beautiful sunsets. The “Pearl” is a gem! This house worked well for our 16 member family. By using every level( expect to climb stairs) we, the Grandparents and each of our four children, their spouse and children had sleeping arrangements. The drawback was having only three showers. We liked our stay enough to return. Clean. Beautiful view. Perfect gateway for large group. Melissa was easy to communicate with. Property was clean and very spacious. The views of Lake Michigan were stunning. Good place to relax with family and friends. Highly recommend the pearl. Third year at the Pearl! This was our third summer vacation at the Pearl and it was the best. Location and lake views are major attractions. The accommodations were great, too! Two large living rooms and the deck were used extensively and enjoyed by all. This house is beautiful with spacious rooms, gorgeous views, and met the needs of our large family. The owner gave very prompt responses and helped accommodate some of our special needs. Our group was very active, so the walk to the beach and the pool, using the stair walkway, suited us just fine. The option to drive is available as well, but parking might be an issue. With 4 levels, the stairs in this home are not for faint of heart, but the different levels do help with separation of groups, if needed. There were beach towels provided and basic amenities; it was very clean and in great condition. My large brood was more than pleased with our stay! Our group stayed here for 3 nights in August. We had plenty of room to spread out and everyone had a bed or shared a large bed with one other person. We managed to park 9 cars in the driveway (no easy feat) which prevented us from having to use the overflow parking, which was great as the lot is quite far from the house. We appreciated the laundry room, clothing steamer and iron. Grill was great and all grilling tools were provided. Beautiful views of the lake from the kitchen level (especially while doing dishes!) and balconies. Two ovens so helpful and dishwasher made things easy. This rental would be best for a group of physically fit people - many stairs to and from the beach and in the house - kitchen is located two flights up from the entry level, with sleeping located on all 4 floors. Lots of ups and downs all weekend that I imagine would be difficult for older folks or anyone with physical challenges. Overall we had a great stay, but I feel like there are a few things that could make this property even more ideal. We wished there was one more full bath, as 3 showers in a house that sleeps 20 was challenging when getting ready for a night out after a day at the beach! Spare linens would have been helpful - bath and hand towels in particular. Kitchen was a mish-mosh of pots, pans and dishes, no plastic containers for leftovers, only 1 kitchen towel that we could find, and all knives were terribly dull. One night was rather chilly and we could not locate any extra blankets. We did not have access to the garage door, only the interior door to the garage, but the garage was where the beach chairs and equipment were located - we had to carry them up and out through the front door. NO BEACH TOWELS were provided. I find this so strange for a beach house rental! Additionally, beach equipment was very limited -for such a large property I would imagine more chairs, umbrellas, coolers etc. would be available. Bedrooms did not all have closets with hangers. Finally, the bathrooms did not have tissue (yet one had a beautiful decorative but empty tissue holder) - typically in a rental home situation each bathroom is equipped with a box of tissue. These things are rather minor but would have made a huge difference in my impression of the home! Overall a great property with plenty of amenities. We comfortably stayed there with 12 adults and 4 children. The walk to and from the beach isn't meant for people who aren't physically fit. The house sits very high up on a hill, but because it sits on a hill, the views are absolutely stunning. There wasn't any outdoor space, or fire pit. When you're at the house you're pretty much inside. Also be prepared to bring your own toilet paper, paper towels, dish washer soap and laundry detergent. They only provide you with a limited amount.